Joseph J. Dutko was born in Trenton, NJ and resided in Hopewell Township. 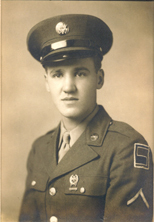 He served in the European Theatre during World War II and fought in the famous Battle of the Bulge with the 87th Infantry Division, 346th Regiment O and R Platoon. He was honored by the Philadelphia Historical Society and WFYY for his contribution to the War Letters Project. In civilian life he was considered a master craftsman, he designed and built his own home. He was also an accomplished free-lanced photographer. He photographed over 400 local weddings and for many years photographed Little League and other sports teams in the Pennington and Trenton, New Jersey area. One of his photos is published in the International Library of Photography. He and his family hosted several years an end of ride picnic for the Anchor House Ride for Runaways and support crew at their home in Pennington, New Jersey. He enjoyed golf, gardening and playing the accordion and traveling, which he and his wife Dorothy did extensively throughout the United States and Europe. Joseph and wife Dorothy had six children and he passed away at the age of 79. He was a true Patriot who served his state and Nation with distinction.